yep I'll be there. I'm loving the renderings of whats planned as well. Awesome, see you there. Glad you like the renders too. Last edited by Tribute; 02-20-2013 at 09:17 AM. Here are the renders that are being used as reference for the exterior. We'll see how nicely the finished product comes out and how close it matches up to the renders. I saw your SIG and I have to come here to find out what you're up too... So this photo is not you real car? I almost fall on the floor! That look is so Cool!!! Can't wait to see the final result!!! I would keep heritage grill black along with chrome tips. Monchy, Thanks for the high praise! I'm glad you like it. You are correct, these are not real pictures of the car. I worked with Vengeance to take a couple of photos and altered them to come up with the right look for what I was going for. It took us a coupe weeks to get it just right. Then worked with SLP and Altauto on the specifics and to get their buy-in to go to production with it. SLP doesn't actually have a public release of a ZL770, they go full public production up to ZL700, what we did is take my ZL600 as a baseline and then combine that with the 770 package and a few other things in the mix and out comes the ZL770. They have actually only put together one other ZL770 which is black with white stripes and went to a lucky winner of a charity raffle. So it is pretty cool to have been this involved and to have one of 2 out there like it, and the only Hugger Orange ZL. I look forward to seeing how it all turns out. Altauto is a beast at auto body and paint. I was told they are doing approximately 6 coats of base, applying the stripes and then 5-6 coats of clear. Something close to that. So with the PPG quality paint and all the layers, it should really shine and be durable. Also, I know I'm in good hands with SLP piecing together all the right components for the build and the custom built and forged 427. This thing should sound ferocious. I think the target time frame of completion is late April. Hey CamaroI - I appreciate your suggestions... I actually decided on painting the Heritage Grill Hugger orange as well. We did a few renders with that and the black out area in either gloss or flat black. It pulled away too much from all the stripes. 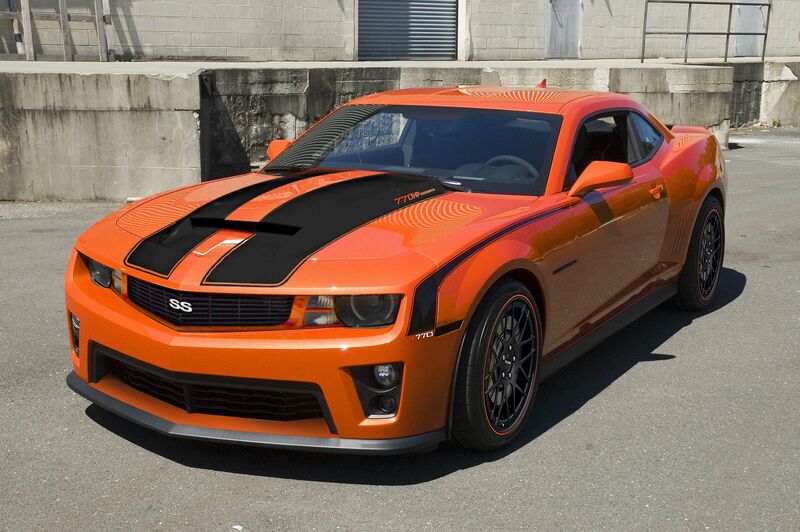 Also, I felt in the end it is closer to the Heritage Camaro it is paying tribute to with it painted Hugger to match. The exhaust tips, I wanted to try something different. There is another member out here that blacked out his exhaust tips (D0truji) on his ZL585 and it really looked great. 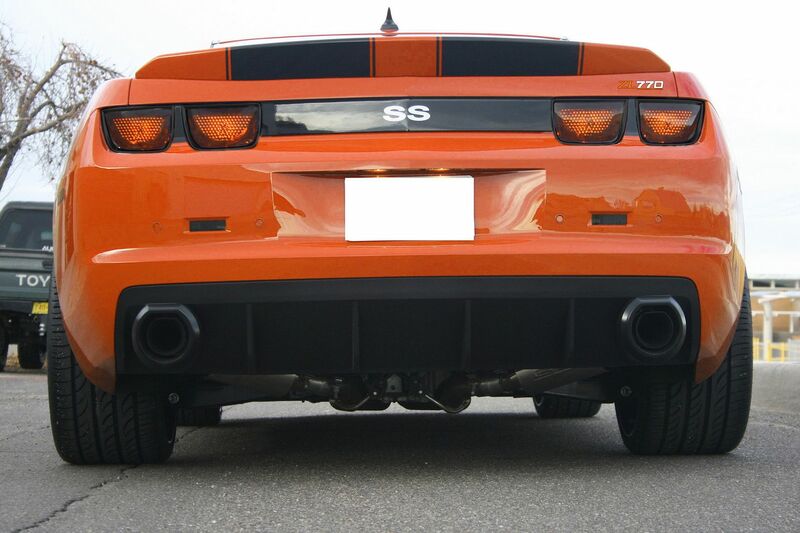 I actually took the image of his rear and we applied the Hugger Orange and it's really going to look great. Also, in talking with SLP their high end Panther has tinted bezels, so we wanted to do a few things to differentiate from the other ZL models. Also, the goal with this car was to have no Chrome at all. Everything that was once chrome is either now scuffed and repainted or Onyx material now. Including the badging. The black top on the Heritage Camaro is actually old school cloth/leather top. We did do a render with the top black and it just didn't flow right. Totally understand on choices. I must say though the chrome on the rear diffuser was one of my favorite factors as you know leading me to purchase one : -). Mine at shop this week getting painted. Will post some pics up. As you know I am doing a tribute to your last look :-). Actually still attempting to get that hood from SLP. Any connections with your area rep on doing that?? Just amazing! Only one more thing to say.... You better be on CFest I have to see your creation in person! I agree that the chrome tips do stand out, I'm a fan of them and they do look good on that diffuser. I think its pretty awesome that you are paying tribute to BOT and building out your ride like it. Perhaps the biggest compliment. As far as the hood goes. That will be very tough as those will only sell to SLP ZL vins. We are only allowed one per car. I'd keep an eye out for a blem model on their ebay store. Thanks again! SLP was talking about trailering my car over to C5FEST. I might not be able to make it, but that doesn't mean my car can't. I just hope if I can't make it, people take some good pics and share with me! Looking forward to meet you! I hope you be there!!! Likewise. Hopefully it works out. I hear ya. I'll see what I can find out.